Tue., July 31, 2018, 9:22 a.m. While the land is expected to be left natural, with some possible limited recreational use near the river, the newly approved cleanup plan would bring the area back to standards that would allow someone to live there. Cleanup of the 7.8 square miles where the D, DR and H reactors at Hanford once produced plutonium for the nation’s nuclear weapons program started in the mid 1990s. DOE and its regulators have operated under what they have called “a bias for action” – not waiting until all cleanup plans are made to start work. To date, $374 million has been spent on cleanup near the three reactors, with the plan for completion of cleanup expected to cost $200 million more, mostly for ongoing work to remove contaminants from groundwater. The final plan, called a record of decision, was signed Monday by Andrew Wheeler, the acting EPA administrator after the resignation of EPA administrator Scott Pruitt earlier this month. EPA is a Hanford regulator. The Washington state Department of Ecology has taken the regulatory lead on cleanup of the area around the reactors, but final sign-off on the plan was required from EPA. Hanford workers identified 104 waste sites near the three reactors, with 99 of them already cleaned up and awaiting confirmation that the work was adequate. At the nine Hanford plutonium-production reactors, cooling water and debris were disposed of in underground drain fields, ponds, trenches and burial grounds. Spills and other spreads of contamination created other waste sites. In three places near the D and DR reactors workers dug down to groundwater more than 85 feet deep to remove chromium contamination that had spread through the soil and was contaminating groundwater that flows toward the Columbia River. Enough soil was excavated in one place to create a hole covering the area of about seven and a half football fields at the ground’s surface. The hole was so large it had to be engineered like an open pit mine. The remaining five waste sites are much smaller. “All the big stuff is done,” Lobos said. In one place wasps that got into contamination built nests on power poles. The contamination on the poles still must be removed, but they remain in use. In another place some equipment was decontaminated, leaving some contamination in soil that must be dug up. Other work has included tearing down dozens of support buildings and “cocooning” the three reactors. The reactors still stand, in part. They were torn down to little more than their radioactive cores, sealed up and reroofed. Plans call for leaving them cocooned for 75 years as some radioactive decay occurs, making eventual demolition safer for workers. 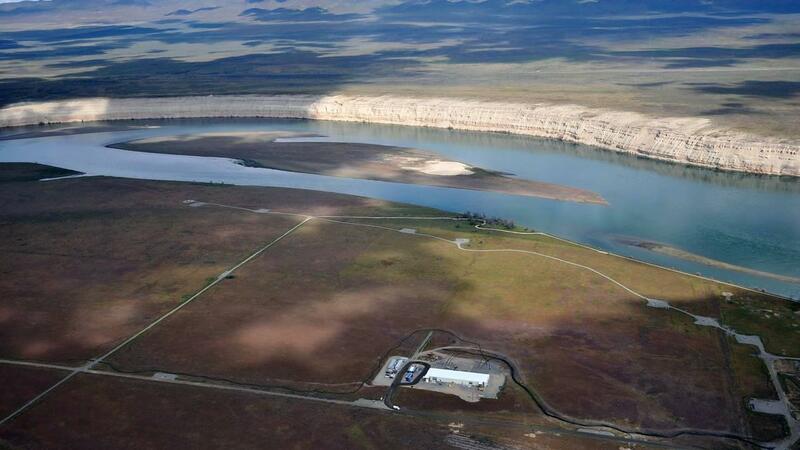 Protecting the Columbia River was a priority for Washington state, the tribes and others interested in the future of Hanford when cleanup began, said Anne White, the DOE assistant secretary for environmental management. Continuing groundwater cleanup is planned to achieve drinking water standards, including an expansion of work, according to EPA. DOE now has two groundwater cleanup facilities near the three reactors, removing hexavalent chromium from groundwater. The chemical was added to reactor cooling water as a corrosion inhibitor. Groundwater treatment near the three reactors will continue for about 12 more years. The remaining waste sites should be cleaned up in the next two years. However, another 38 years will be needed to reduce a relatively small plume of radioactive strontium 90 in the area, according to EPA. Nature will be allowed to take its course and the strontium to radioactively decay to meet drinking water standards over about four decades. DOE has a “completion mindset” and the substantial progress made near the three reactors “is a shining example of that,” White said. A similar record of decision was approved earlier for the area around Hanford’s F Reactor, which is downstream from the D, DR and H reactors. Published: July 31, 2018, 9:22 a.m.